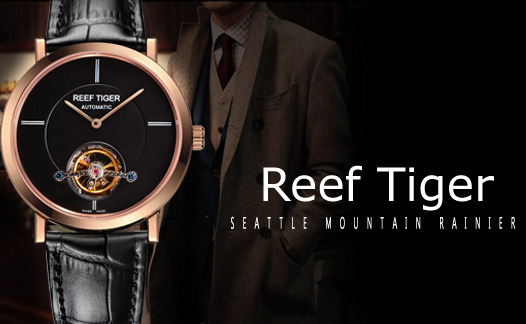 Reef Tiger Seattle, which is inspired by Romantic spirit, adds romantic elements on the simple design of original Mountain Rainier, launches new tourbillon watch. This watch upholds the thinness and elegant tradition of the Seattle, the only decoration on the simple dial is a tourbillon device at 6 o’clock, restoring the art beauty of the watch. To pass the romantic sense of the Seattle series, this tourbillon watch abandons the precise hour markers of generous watches, there are only cutting markers at 0, 3, 9, the good things have no fear of the passage of time. At 6 o’clock, there is one ruby embeded on the center of the skeleton tourbillon, with the rotation of the balance wheel, the movement parts are legible, the aesthetic feeling of time appears on the wrist. The lugs are simple and slim, straight lines replace the curved lugs design, but they can fully fit the wrist and blend with the band, couple with the case, more refined and elegant. This watch is equipped with crocodile leather strap, which is carefully stitched by hands, reflecting pure Swiss watchmaking tradition. The clasp is particularly designed by Reef Tiger, very easy to be worn. 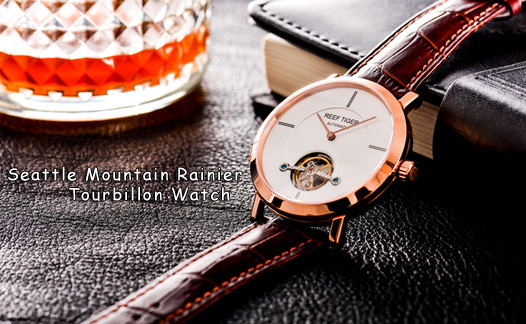 To match up with the simple style of the watch, Mountain Rainier abandons the complex folding buckle, while uses more simple pin buckle, which is engraved with REEF TIGER logo, delicate. 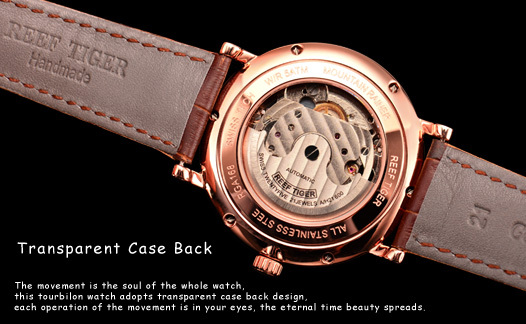 The movement is the soul of the whole watch, this tourbilon watch adopts transparent case back design, each operation of the movement is in your eyes, the eternal time beauty spreads.